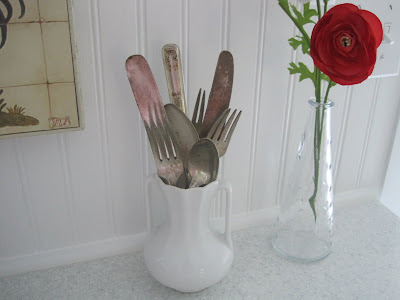 It all started with a beautiful old butter knife! I was so excited to find some more pieces last week to add to my growing collection! The owner of the little shop had a couple of containers of these, and I had so much fun going through them and picking out my favorites! 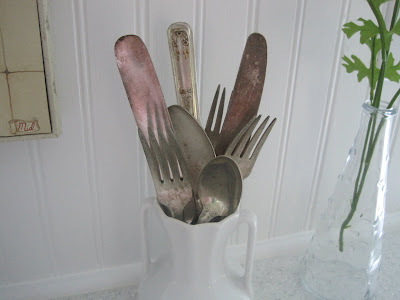 Now I found the ones above on the cheap~ all except the butter knife! (Some are older than others...) I have learned one of the secrets is to be patient when looking. I consider myself quite lucky indeed to find even two things at a time! (Unless you happen on a store where the owner is a collector herself!) 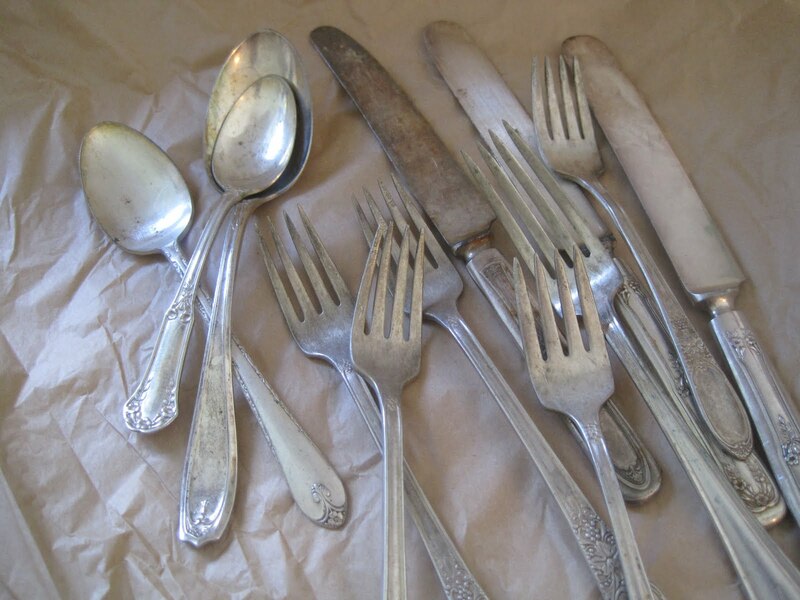 And I have to admit, I love searching through random and mismatched utensils here and there and discovering something wonderfully timeworn! And the price is often a matter of pennies! I love the way they look in this sweet vase I found at The Weed Patch, one of my favorite shops! 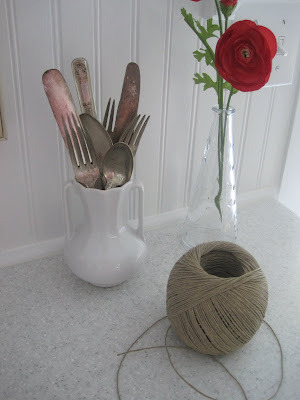 I was wrapping something with this twine, and noticed how good the color of it looked with the things next to it~ the red of the flowers, the white vase and aged silverware. I see you have another passion now. = ) One day when you visit my place, once I have one again, I'll have to show you my tea spoon collection. It was DH's grandmothers. I love old silver too. I found my vintage, silverplated set (service for eight with serving pieces and iced tea spoons) for just $10! 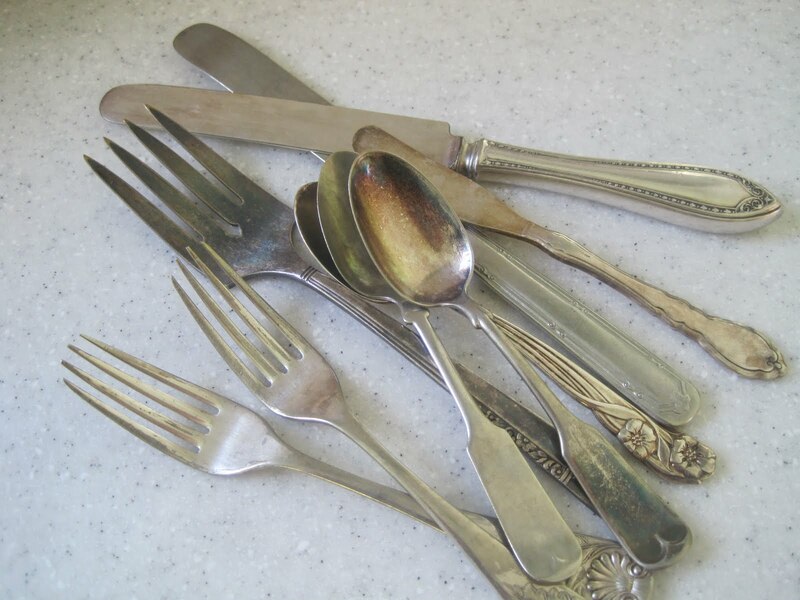 The pieces were in a shoebox at a garage sale and were completely black, but they polished up beautifully. The set is called "First Love," and it came out about 1939. I have since picked up more wonderful random pieces here and there. It doesn't matter to me one whit if things don't match. Isn't it fun? Yes, it's an addiction! Speaking of the Weed Patch, we should go there soon. I love that place! I am not going to say why, but you've gotta check the link out below... Okay, maybe I will give you a hint. Think paint! You have an award on my blog...come and get it! What a cool collection! I think it's always fun to hunt for thing!